Enjoy a ship which is tailor-made for the discerning traveller. With a capacity of 686 guests each, Azamara Journey and Azamara Quest - are just right. On board Azamara Journey you will forgo the crowds and indulge in cruising at your own pace. Azamara Journey features two speciality restaurants, concierge amenities, spa and wellness centre, live entertainment and daily enrichment programmes. Azamara Journey offers the big advantage of being able to sail to places larger cruise lines can’t, for instance, Azamara Journey sails to the doorstep of Bangkok, while other large cruise lines dock a few hours away. Azamara Cruises sail to the city center of Bordeaux, the heart of Seville, and within a short walk to Hong Kong’s buzzing nightlife and Shanghai’s famous Bund. Let Azamara satisfy your passion for fine cuisine while at sea. Prepared by renowned chefs, Azamara culinary delights are made fresh, using only the finest ingredients. From casual eateries serving a buffet of delights to Azamara Journeys two speciality restaurants where each meal is a culinary masterpiece, there are delectable choices sure to please the most discerning of palates. Enjoy beautiful indoor dining venues or outdoor poolside dining. Aboard Azamara Club Cruises, the choice is yours. Specialty Dining & Fine Wines Azamara proudly features two speciality restaurants, Prime C and Aqualina. Speciality dining is complimentary for suite guests (Club World Owner’s Suites, Club Ocean Suites and Club Continent Suites). 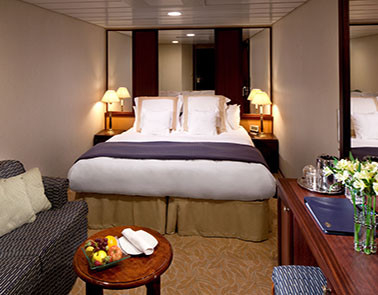 For stateroom guests, there is a $25 per-person cover. Reservations are highly recommended. Whatever your interests, indulge them aboard Azamara. Enrich yourself with an informative lecture, shop leisurely in the boutiques, or add to your art collection (or start one) during an onboard art auction. Relax and take in a live show, or if you're feeling lucky, step into the casino. Azamara Journey amazing array of entertainment options ensures there’s never a dull moment. Azamara Journey On Board Activities Make your luxury cruise holiday the best it can be by participating in Azamara's many onboard events and programmes. From dance lessons to spirited competitions, you will find a variety of fun and exciting things to do, no matter what your skill level. Each evening a programme will be delivered to your stateroom listing the activities for the upcoming day. Make plans to join us and add even more laughter and fun to your voyage. If you’ve ever wished for a free week or two to reboot, this is it. Treat yourself to health, beauty and exotic massage treatments at the spa. Launch a new personal training regimen, give acupuncture a try, and relax with sunset yoga. A voyage is a great time to fit in all the things you never have time for at home. It’s also a great opportunity to try something new. On Azamara Journey you’ll be impressed by the array of complimentary onboard fitness and nutrition classes. Do something different every day of the week! For additional cost, you can also boost results with personal one-on-one instruction and services. If you #LoveTravel, Azamara are raised the bar yet again. In early 2016, both award-winning ships saw major upgrades from bow to stern. 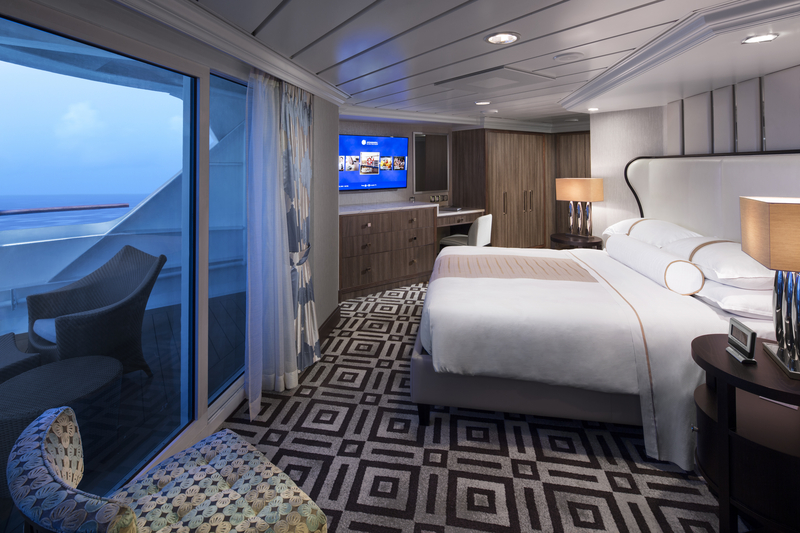 Be among the first to enjoy Azamara’s stylishly reimagined accommodations and onboard experiences. Azamara's aim with Reimagine Azamara is to bring the organic essence of Destination Immersion® onboard in innovative ways. These enhancements have been inspired by beautiful landscapes, flowing waters, and refreshing earth tones, and incorporate a rich blend of modern and contemporary elements. Azamara have always been known for remarkable destinations, and their newest destination will be right onboard the reimagined Azamara ships. Two lower beds convertible to queen size. Flat-screen television. Refrigerator with mini-bar. Thermostat-controller air conditioner. Direct-dial telephone with voice mail. Desk. In-room safe. Hand-held hair dryer. Two lower beds convertible to queen size. Flat-screen television. Some with sofa bed. Refrigerator with mini-bar. Thermostat-controller air conditioner. Direct-dial telephone with voice mail. Desk. In-room safe. Hand-held hair dryer. Features: Completely refurbished with fresh contemporary décor in 2016 Two lower beds convertible to one Queen size bed Some staterooms feature sofa bed 40” flat-screen TV Refrigerator with mini-bar Thermostat-controlled air conditioner Direct-dial telephone with voice mail Writing desk In-room safe Hand-held hairdryer USB ports under bedside reading lamps Complimentary Stateroom Features: Luxurious cotton bed linens with duvet Terry bathrobes and slippers 24-hour room service Welcome fruit basket at embarkation Fresh-cut flowers Tote bag Use of umbrella and binoculars Shoe shine-service Turndown treats Deck 6 only: All Club Oceanview category 08 staterooms have an obstructed view. Please note that even though category 08 Club Oceanview staterooms have obstructed views, these staterooms represent an excellent value. 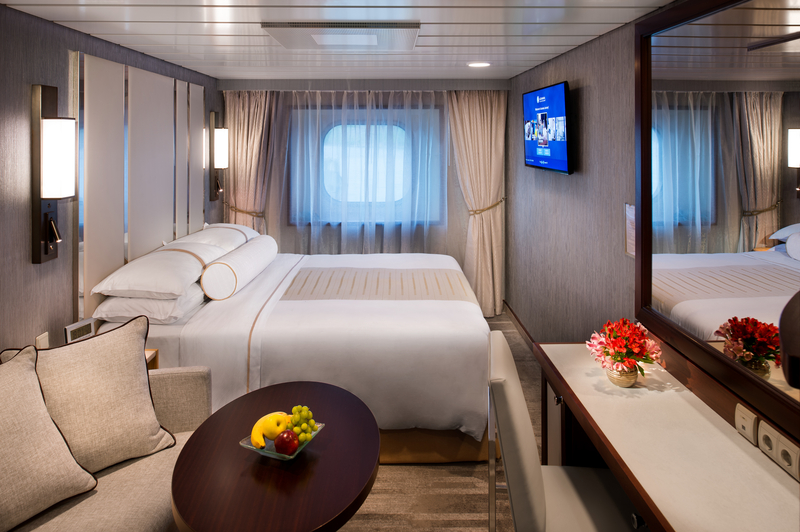 Each stateroom features a picture window providing natural light. You’ll find them comfortable and welcoming with all the amenities of a Club Interior Stateroom. Two lower beds convertible to queen size. Floor-to-ceiling sliding glass doors. Sitting area with sofa bed. Veranda. Flat-screen television. Refrigerator with mini-bar. Thermostat-controlled air conditioning. Direct-dial telephone and voicemail. Desk. In-room safe. Hand-held hairdryer.